Starring: Chris Evans (The Avengers), Scarlett Johansson (Iron Man 2), Anthony Mackie (The Adjustment Bureau), Sebastian Stan (Black Swan) and more. Rating: PG-13 for intense fighting violence. Marvel keeps out-doing itself. Every time I watch one of these Marvel cinematic universe films, I think, “Man, how can they make the next film just as good, if not better?”…and then the next film does exactly that! Such is the case, once again, with Captain America: The Winter Soldier. Continuing their impressive streak, Marvel brings the second Captain America film with class, conviction, conscience and cool cinematography. A smart decision on Marvel’s part to bring one of the darker storylines from the pages of Cap’s comic books to the big screen, The Winter Soldier story assuredly meet fans with delight and satisfaction. Being darker definitely helps shed more light on the characters and makes this sequel both exciting and intriguing. One of the major benefits that Marvel has in its pockets is the cast continuation as Chris Evans, Samuel L. Jackson, Scarlett Johansson, Cobie Smulders and more have been afforded the opportunity to grow into and with their characters. Each of them are understood more, believed more and cared for more. 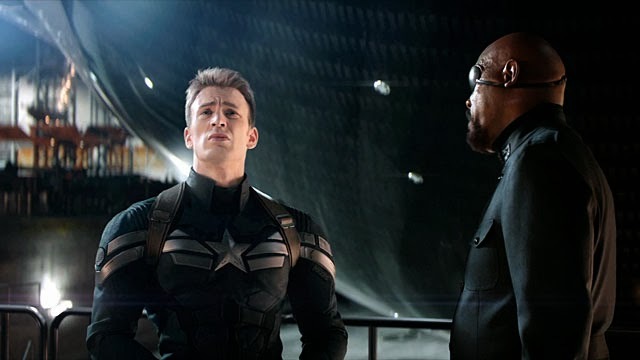 This is a Captain America movie, but there is also ample time for attention to Nick Fury, Black Widow and others (a challenge that The Avengers faced and arguably succeeded in). Hey! This isn’t a Black Widow movie! The newcomers to the Cap/Marvel line are also equally impressive and seem as if they’ve been a part of the Marvel cinematic universe for a while too as they naturally fit in. Robert Redford, Anthony Mackie (The Falcon) and also Sebastian Stan (The Winter Soldier). Casting continues to be a strong suit for Marvel and it has THIS fanboy excited for future films. So much makes this film a standout (and stand alone) Marvel movie. The acting, the action…complete with plenty of heart-pulsing fighting sequences that are just superb…, the characters, the socio-political commentary and more all make this one solid film that is leaps and bounds above other superhero movies of recent (i.e. Man of Steel, Iron Man 3, X-Men 3, etc) and enables it to be another superhero movie made relatable to real life. 1. It is a difficult to ignore the fact that, since The Avengers, other superheroes exist and can help each other. They keep Thor: The Dark World out of this conundrum by setting most of the film off of Earth, but viewers may watch Captain America: The Winter Soldier and ask “If they mentioned Iron Man or The Hulk or fought alongside Hawkeye then what’s keeping them from simply making a phone call to them for some help?” It’s a tricky thing to work around to be sure and it seems that Marvel hasn’t yet found the right way to have all these heroes exist in the same universe but not be around to help each other. 2. It can’t escape overall predictability. BUT, it does pull a few small shocks that please. 3. Some elements and characters end up not really understood or known by those who are not BIG fans of the Marvel universe –A minor complaint as most people who are watching it tend to know/recognize the characters overall. (This is not talking about the bonus credit scenes -of which there are two- since they are, indeed, bonus.) But I suspect that some of the minor-played characters will undoubtedly serve a purpose in future Marvel films (a.k.a. Agent 13, a senator that may not be remembered as also being in Iron Man 2 and a few others). 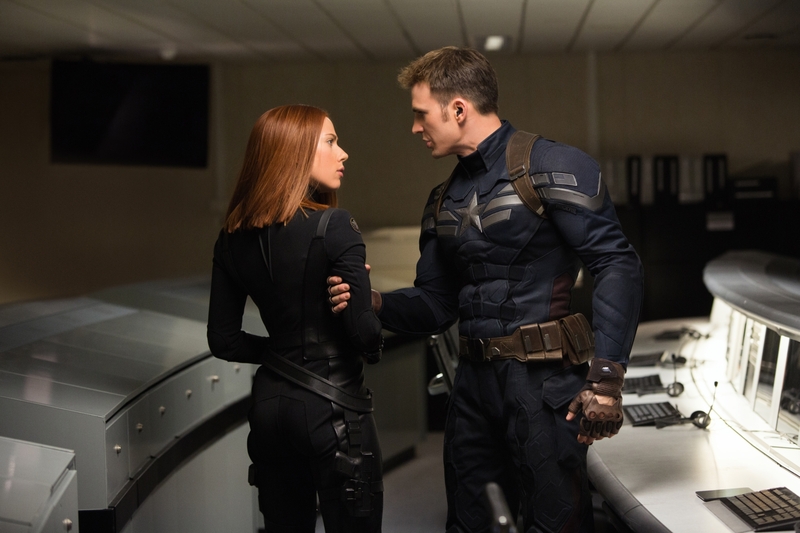 Captain America: The Winter Soldier takes audiences into the battle with Cap as the levels of trust (and distrust), reacclimation, fighting intensity, discovery, deception and loyalty increase continually throughout the film. Utilizing the foundation laid in not only the first Captain America film (including some great “flashback” sequences that add to the flavor of the film), but also in the additional Marvel films, this sequel is a strong assembly of characters, plots and excitement and does NOT disappoint. What is right? To see Captain America: The Winter Soldier and expect it to be a great. Take off to go see it! NOW!! Entertaining, exemplary, explosive and engaging, Captain America: The Winter Soldier is one of Marvel’s best and in terms of sequels is Marvel Studios’ best to date. With the rumored report being that Marvel has planned their films all the way to 2028 it looks as if we have tons more of similar quality to look forward to. Next Movie News Monday for April 7, 2014. It’s a very fun movie, no matter how much exposition it throws at the wall to see what will actually stick. Good review T.
Definitely fun. Marvel really has got a good one here. Thanks for visiting Dan the Man! Completely agree with your score T. Saw it on Wednesday and had a blast. How amazing was that car chase! Hooray! I love it when we agree. 🙂 That car chase was definitely intense. You are right my friend. Thank you for stopping in. I think maybe I’m getting a bit bored of comic book films! Feel slightly terrible for saying that. I thought Winter Soldier was a solid enough film. Entertaining while I was watching. Much better than the first, which is unusual for sequels. And yet, as I sit here and think back to the film it just feels like any other film. The more serious tone was appreciated and at times it felt like there was some urgency, but in the end, it all amounted to the same spectacle that comic book films seem to rely on. I really am getting old! No, it’s okay. I definitely wonder how much the general public will be so accepting of Superhero movies before getting burnt out. The one thing about superhero movies is that the end is 95% always certain. They need to let some movies end where the villain wins…I mean, tv show episodes end that way…why not the movies? -Man of Steel 2 introduces Lex Luthor who is working on a project with intergalactic ties and Supes must battle some villain that threatens all but ultimately is a test from Luthor for what is to come and at the end, Supes meets Batman. -Then…Justice League movie to find Superman and fight whoever. Ha! They totally should be! I think popular movies have a lot of catching up to do in terms of where they should be compared to popular TV shows. Looks at some of the all time great TV shows – The Wire, The Sopranos, Breaking Bad, House of Cards, Game of Thrones, Battlestar Galactica – these were not all happy fluffy, happy ending all the time shows. And the general public still lap them up. Yes, they’re not comic book heroes, but the characters in the shows are heroes to those who watch. People die, the shows tackle depressing issues but it doesn’t put people off. Rather, they flock to seeing more human characters. 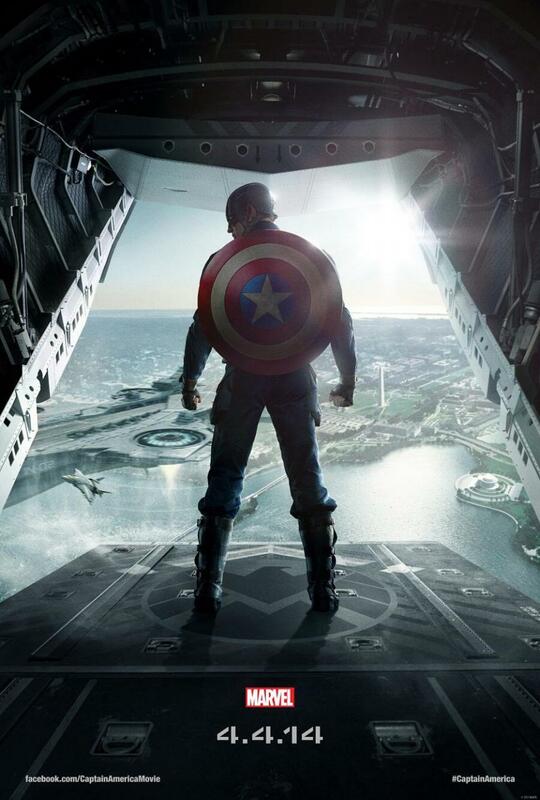 That moment in Captain America when that very important character… Well, you know? I really wished they had stuck to their guns there. Same with Coulson. Strong moves like that shake up the comic book film genre and it is in dire need of that at the moment. Haven’t read a bad review on any of the circuit’s blogs and sites. I never really bought into The Winter Soldier angle in Marvel comics. Timed too closely to DC comics’ take on Jason Todd and The Red Hood. Though, the film certainly looks like it sells the bad guy/assassin well. So SHIELD, which used to work for the White House, pre thaw out of Cap. Now is larger and more powerful than the big house in DC. I’m kind of liking the subtle conspiracy angle. Which may give Robert Redford a new income stream in later films of the franchise. It looks like this film may not get everything right. But most things! While leaving enough grist and characters for later offerings. 🙂 I am glad you mentioned the subtleties of the film as it really did bring them out. I hadn’t thought about the Jason Todd/Red Hood story arc to compare with, but you are right. Thanks for that enlightenment. I was concerned with how much attention each character would get, but they really balanced it out very well. The first Captain America disappointed mainly because I had such high hopes for it. That said, I still enjoyed it. I’m looking forward to seeing the sequel, especially as it’s getting such rave reviews!